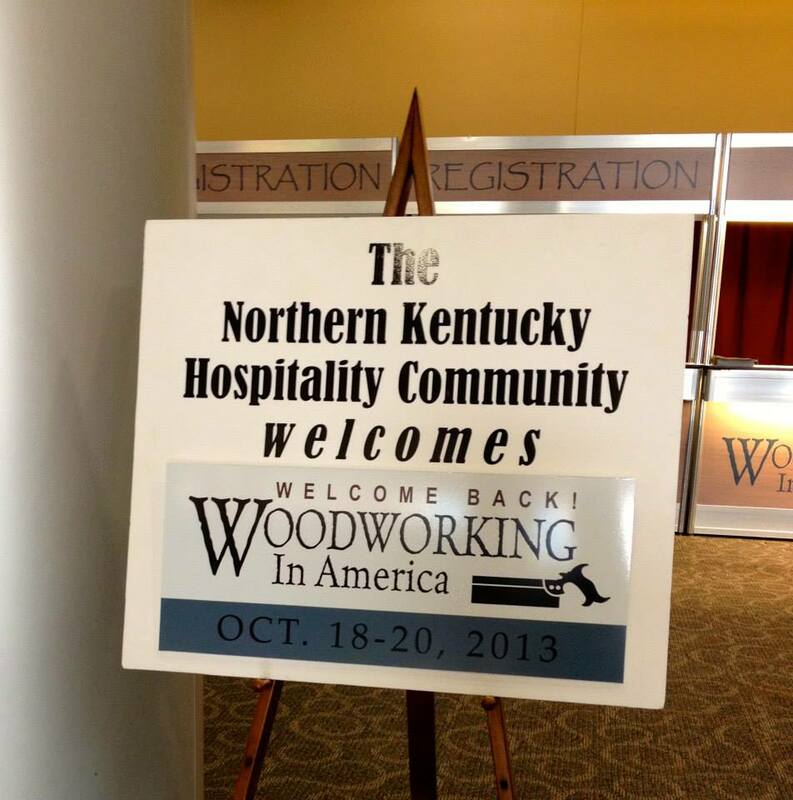 This past weekend (October 17th-20th) I had the opportunity to attend Woodworking in America in Covington, KY (the greater Cincinnati area), which is one of the biggest woodworking conferences of the year, sponsored by Popular Woodworking. We usually have several representatives from Highland Woodworking attend each year, and while we don’t have a booth at the event, we are always excited to get to go and hang out with all of the “popular” woodworkers. On Thursday night, our friends from the Modern Woodworker’s Association hosted a meet-up at Keystone Bar & Grill. It was really exciting to meet some of the online woodworking world “celebrities” including Chris Adkins of High Rock Woodworking (and the new host and creator of Highland Woodworking’s Product Tours), Tom Iovino of Tom’s Workbench, Dyami Plotke from The Penultimate Woodshop, and Sean Wisniewski of The Corner Workshop. These guys are the voices behind the MWA Podcasts, and they sound just the same in person as they do online. It was a fun evening of socializing and reuniting with some hilarious woodworkers. 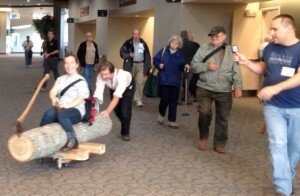 Friday was the first official day of the conference and Roy Underhill made a grand entrance to his Timber!!! 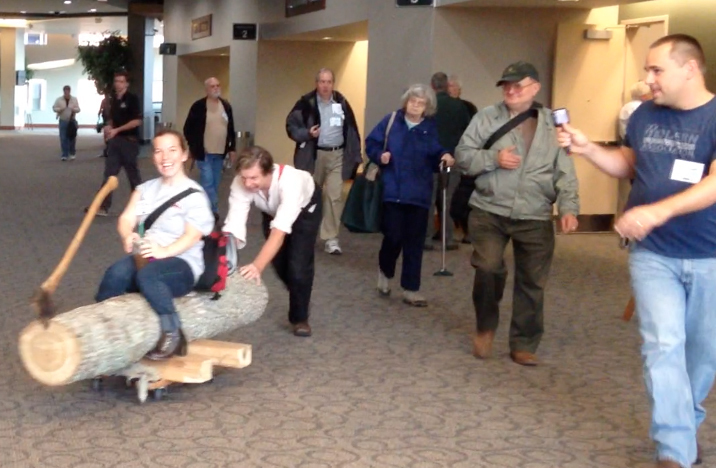 class by carting a gigantic piece of tulip poplar through the Northern Kentucky Convention Center. Unfortunately, I made the mistake of making eye contact with Roy and before I knew it I was sitting atop the log and steering it with an axe as Roy continued traversing through the crowds into his classroom. Megan Fitzpatrick, editor of Popular Woodworking, later thanked me for stepping up and not making her be the usual person that Roy makes a spectacle out of. A large portion of Friday and Saturday consisted of classes and demonstrations taught by some amazing woodworkers that I have looked up to for awhile, including the aforementioned Roy Underhill and Megan Fitzpatrick, as well as Christopher Schwarz, Peter Follansbee, and Glen Huey. One of my favorite teachers in attendance was Mary May, who I first met at the Lie-Nielsen Open House last July, and I couldn’t help but be mesmerized by both of her carving classes (Carving Life into Leaves and Linenfold Carving), where she made every cut look effortless. I also attended Peter Galbert’s Windsor Innovations class, where he discussed some great tips on the chairmaking process. Both Mary and Peter will be teaching upcoming classes at Highland Woodworking, and it was fun to get a small preview of what they have in store for these classes! When I wasn’t participating in classes I was down in the Marketplace, which was basically a woodworker’s toy store full of vendors demonstrating their new and popular tools. A lot of our vendors were in attendance including SawStop, Micro Jig, Earlex, Hock Tools, Lie-Nielsen Toolworks, Scott Meek Woodworks, Easy Wood Tools, Saburr-Tooth, and Knew Concepts, amongst others. We got to see a lot of their new products that they were featuring and we’re really excited to be getting them into our store soon! Our online TV show, The Highland Woodworker, also had a booth showing recent episodes. Chuck Brock was manning the booth and occasionally snuck away to shoot segments for future episodes of the show! We’re looking forward to seeing the finished product! At the Lost Art Press booth, they had the anticipated release and signing of To Make as Perfectly as Possible. At the signing were authors Don Williams and Phillip Lafargue, as well as editor Christopher Schwarz. They had both the standard edition, and the limited deluxe edition, which was one of the most beautiful woodworking books I have ever seen. In the last Friday session, many members of the online woodworking community gathered for an Online Woodworking Roundtable, moderated by Megan Fitzpatrick. The participants of this roundtable included the three voices behind Wood Talk Online Radio (Marc Spagnuolo, Matt Vanderlist, and Shannon Rogers), the three voices behind the Modern Woodworker’s Association podcasts (Tom Iovino, Chris Adkins, and Dyami Plotke), as well as Wood Central, Woodnet, Giant Cypress, and more. 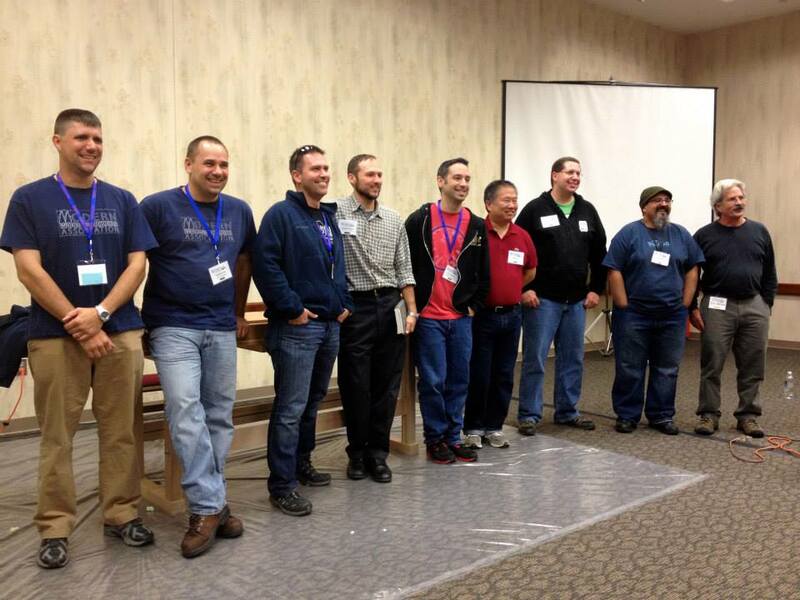 Participants in the Online Woodworking Roundtable. I believe the Online Woodworking Roundtable was a new addition to the WIA lineup this year, and with all of the content that the above participants are putting out there (amongst many other online resources), it was very relevant to the online woodworking experience that even you as a reader of this blog are getting right now! Each participant went around and described their contribution/site and then Megan opened the discussion to the floor and audience members were able to ask these guys questions about where they see the online woodworking world going and the differences between the resources we had 10 years ago and what we have now. One of the main things I came away with is the fact that the online woodworking world has created more of a community amongst woodworkers, where we can easily share our tips, projects, and progress with just the click of a button. It has brought woodworkers together, like the guys of Modern Woodworker’s Association and Wood Talk Online, who are able to collaborate and share their work with the community. That evening we were lucky enough to run into the Wood Talk guys in the hotel lobby and ended up going to dinner with them at the Behle Street Cafe, for some great food, fun, and conversation. The second day was pretty similar to the first with more class discussions, marketplace wandering, and enjoying the company of fellow woodworkers. Overall, Woodworking in America 2013 was a very informative, fun, and educational event and we are already looking forward to going back next year! 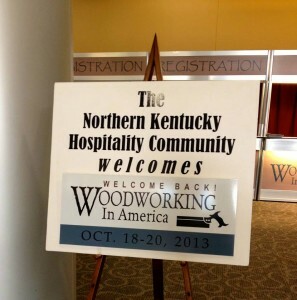 To see more photos from Woodworking in America 2013, click HERE to go to our photo album! Great post. We had a great time at WIA13 too and can’t wait to see everyone next year. Also, I’m very excited about my first trip to Highland in a week and a half.